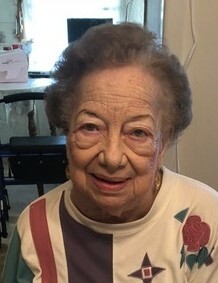 Obituary for Marjorie (Hoff) Dethlefsen | Bayonne Memorial Home, Inc.
Marjorie Dethlefsen (nee: Hoff) passed away peacefully on Wednesday, July 11, 2018. She was born in Bayonne and was a lifelong resident. She was an underwriter for the Home Insurance Company and later worked at Globe Delicatessen. Mrs. Dethlefsen was a devoted member of Grace Lutheran Church. She was also a member of the Horace Mann P.T.A. Mrs. Dethlefsen was predeceased by her beloved husband, the late John Dethlefsen; and her cherished daughter, the late Lorraine Dethlefsen. She is survived by her loving son, Robert Dethlefsen; her adoring grandsons, Brian and Kevin Dethlefsen; and her dear sister, Dorothy Reilly. The funeral will be conducted by Bayonne Memorial Home, Inc. on Saturday, July 14, 2018. Visitation will be held on Saturday morning from 8:30 a.m. to 10:00 a.m. at the funeral home. A service will be held at 10:00 a.m. followed by interment at Bayview Cemetery, Jersey City.